We are proud to be awarded the Rising Star 2018 award from FinancesOnline marketing automation software list, a popular review platform for B2B software and services. The recognition is given out each year to products providing exceptional solutions for B2B companies across many key categories, including Marketing Automation and CRM. 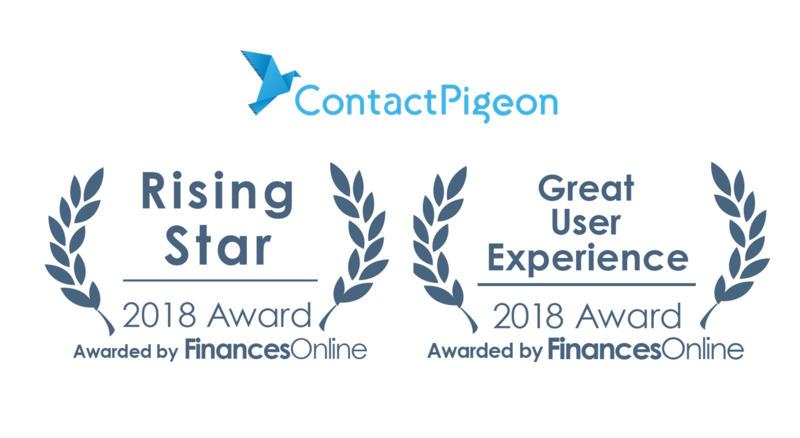 In a recent review published this February, FinancesOnline had ranked ContactPigeon as one of the top 100 Marketing Software products with an overall score of 8.9 out of 10, and user satisfaction of 92%. We are even more thrilled to be given the Great User Experience award for top 20 marketing automation software as recognition for our dedication to customer success. At ContactPigeon, we have an inherent culture where we grow along with our customers. We believe that we provide not only the tools but also the know-how to maximize the outcome. That’s why we adopted a distinctive dedicated customer success model, where an eCommerce expert will work with your business from planning, goal setting thru the execution of marketing automation ideas. This support model is key in helping our customers to grow on average 3x in online sales results through email marketing and other message channels. Please visit FinancesOnline.com to post your own review of ContactPigeon. We look forward to supporting our existing and new customers through another amazing year of growth. Ready to start growing your eCommerce business? Speak to one of our experts today.